The Cowlitz River is the only place in Washington that has hatchery steelhead now. That’s it. Essentially, it’s a ghost town everywhere else. This being said the season has started off on the slower side. However, the numbers of steelhead returning are picking up daily. The good thing is, this year the fish seem to be big. There’s a lot of three-salt fish. Meanwhile, conditions aren’t what we’re used to. This year we are facing high, off colored water. Following record rainfall runoff is higher than normal, which is forcing them to pump water out of the dam constantly and that’s not likely to change during steelhead season. The higher flows are making us target the steelhead differently. The equation is simple; the higher the flows, the closer to shore you fish. In most areas if you are more than five feet from the bank you aren’t going to catch fish. That’s the path of least resistance for the steelhead. Even with the high flows and slow start to the season the parking lot is full on the weekends. There was 75 sleds here the other day, which is a reflection of the lack of opportunities in the region for anglers. Pressure is extremely high, which makes fishing tougher. On the other hand, this is the Cowlitz River and we are used to a lot of pressure. Frankly, we have limited other options for hatchery steelhead in the state and that’s not looking like it’s going to change. The main gig right now is near the Blue Creek Hatchery. With the higher, off-colored water, larger and brighter presentations are working best. I’m running larger clusters of eggs. 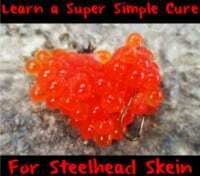 We’re using Red Fire Cure for steelhead on my boat and pieces about the size of a quarter. Don’t be afraid to add a piece of pink or cerise yarn in your egg loop to give you a bigger, brighter, more vibrant presentation. Sometimes we use BorX O Fire, too, but I’ve been leaning more toward the Fire Cure this year. The key is to cover water. Knowing the Cowlitz River if the steelhead aren’t there one hour eventually they are going to show. In another few weeks the steelhead will spread throughout the system from Toledo to Barrier Dam, or even lower depending on water. The steelhead will be in the system through the middle of April. At that point we’ll switch over to spring Chinook. Editor’s Note: Todd Daniels operates Tall Tales Guide Service. 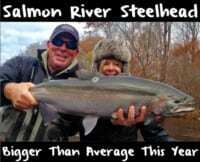 For more information on his Cowlitz River steelhead trips please visit http://talltailsguideservice.com.